The icon Sacred Virgin will be delivered to the ATO zone after the religious procession on July 28,. 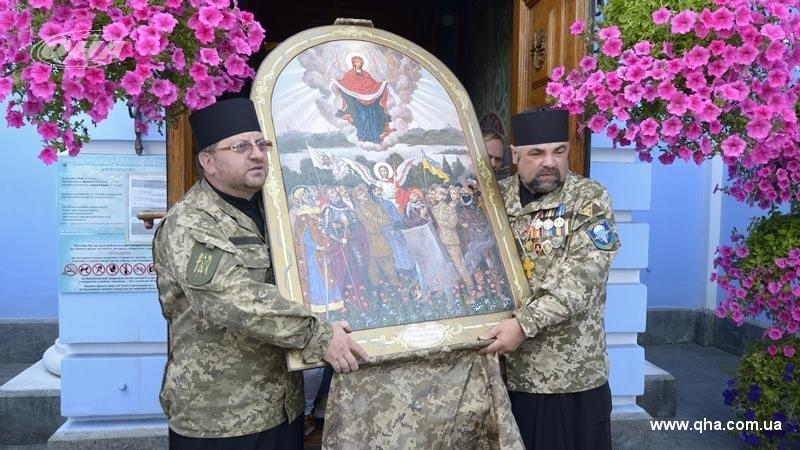 On July 26, the eve of the Day of the Rus-Ukraine Baptism the Head of the Synodal Administration of the Military Clergy of the Ukrainian Orthodox Church under Kyiv Patriarchate John consecrated the icon Sacred Virgin, the patroness of Ukrainian soldiers at the St. Michael's Golden-Domed Monastery. "This icon will become the spiritual symbol of all the defenders of our country," John said. The icon Sacred Virgin was painted by the Ukrainian icon painter Yuri Nikitin. The artist portrayed the Mother of God, who holds an omophorion in her hands, covering heroes. There are soldiers of different epochs from Kyivska Rus to today's Ukraine on the holy image. These are Prince Vladimir the Great, Hetman Ivan Mazepa, Sich Cossacks, Ukrainian Insurgent Army and Ukrainian Galician Army soldiers from Ukrainian history and Maidan Self-defense fighters and volunteer battalions, ATO participants from our days. “It was an honor for me to create a new iconographic "Cover" of the Virgin. It is devoted to the events in Donbas, to soldiers who defend the territorial integrity of the motherland,” Yuri Nikitin says. Later chaplains will bring the icon to the ATO zone for worship and prayers for Ukrainian servicemen. Upon return, the icon will be temporarily located in the St. Nicholas church of the, until worthy place in the garrison church is found.